Front row (left to right): 1. Kitty Peterman, 2. Jeanette Farnachari, 3. Dora Santucci, 4. Dorothy Santucci, 5. Rosemarie Serpa, 6. Glenn Eleanor Munton, 7. Wilda Fincher, 8. Barbara Horton, 9. Mary Loyola, 10. Dorothy Buchanan, 11. Elsie Dutra, 12. Barbara Barthe, 13. Esther Perez. Second row: 1. Barbara Wolfe, 2. Betty Ann Orloff, 3. Bobbi Beatty, 4. Elinor Robertson, 5. Dorothy Kostner, 6. Diane Brown, 7. Elizabeth Walsted, 8. Evelyn Wymer, 9. Marion Rassmussen, 10. Beverly Clement, 11. Helen Mustain, 12. Angelina Garcia, 13. Marlene Walker. Third row: 1. Charles Moore (teacher), 2. Bob Carrol, 3. Clarence Rogers, 4. Billy Gilbert, 5. Marlene Lowery, 6. Joan Culford, 7. Donald Momau, 8. Betty Joe Stanky, 9. Irene Vargas, 10. Felix Coronoda, 11. Charles Stritz, 12. Delbert Erlich, 13. Tom Ross, 14. William Johnson. Fourth row: 1. Buddy Walker, 2. Norman Valponi, 3. Gordon Suits, 4. Wayne Stewart, 5. Jack Huston, 6. Philip Munson, 7. Robert Perez, 8. Billy Berkawitze, 9. Jimmy Clawson, 10. Robert Sanders, 11. Billy Doyle, 12. Robert Armstrong, 13. Charles Eddington, 14. Spike Allen, 15. Donald Rego. Credits: From the collection of Glenn E. (Munton) Buck. The kids in the picture are members of the high school graduation class of 1950. 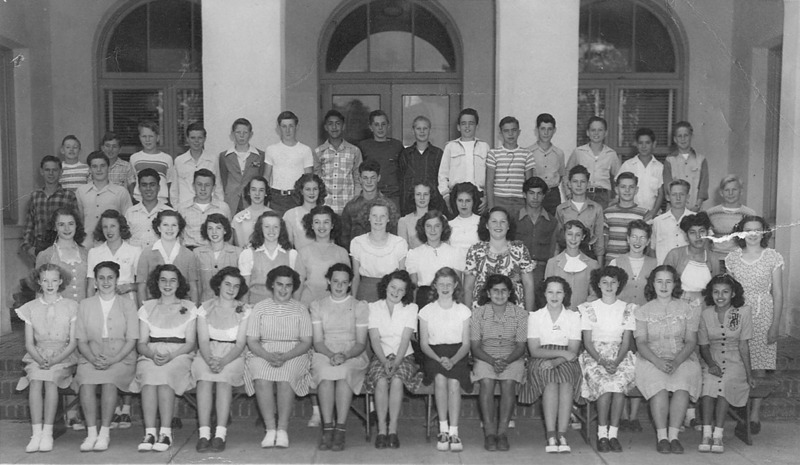 To find other pictures of the class of 1950 in the archive, see Livermore class pictures listed by year of high school graduation: 1950. And if you have any pictures of the class of 1950 that you would like to share, please submit them to the Archive.